Christmas is around the corner and it's time to plan and prepare for the festivities that lie ahead. It's a changing time in our extended family, a time when celebrations are more important than ever. A time when care for each other is paramount. Christmas challenges us to bring forth the dynamic teachings of Jesus Christ. No matter what your religious beliefs are, most will agree that Christ's teachings inspire dignity, care and love, and that is what Christmas is about. It's a time to celebrate our connections and honor those we love with gifts of good food, hospitality and thoughtful presents. If money is tight, it means you have to think deeply about a gift that is both affordable and thoughtful--it could be a hand-made item or a coupon for service. Those gifts require the greatest investment. So, for me, similar to Thanksgiving, it means preparing my home so that it's a comfortable and welcoming place to host family and friends. It means putting an extra personal touch on gifts for those I love, and planning simple events that bring us together such as playing board games, watching a favorite movie, hiking outdoors, walking the decorated streets of nearby towns and cities, and sharing delicious meals together. This is a turning-point Christmas for my family, and hopefully one that will lay the path for loving, kind Christmases to come. 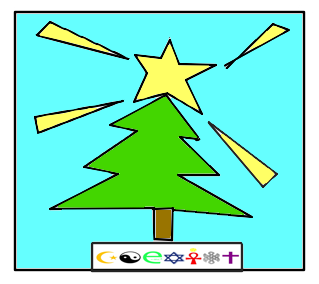 And to those who celebrate Christmas, Hanukkah, Kwanzaa, New Year's and more, I wish you Happy Holidays! May the season inspire you to bring light and warmth into your homes and communities.